Hello Summer! At the SunVenture offices, it’s all hands on deck for another unforgettable summer of memories on the water. If you are vacationing in Destin Florida, enjoying the emerald green waters is a must. The SunVenture offers a variety of different experiences, all chartered by our Coast-Guard licensed captains, so you can enjoy every moment. 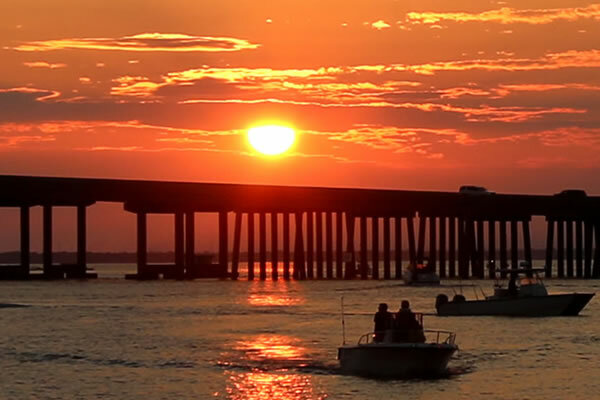 Our most popular Destin cruises are our daily Crab Island excursions. Rated as one of the top things to do in Destin Florida, Crab Island is the ultimate Destin water experience, as you relax in shallow, emerald green waters and enjoy local attractions like water slides and live music. The only way to get to this sandbar of fun is by boat. The SunVenture offers a convenient, safe and inexpensive way to venture out to Crab Island. With two daily cruises, the SunVenture Crab Island Cruises are a fraction of the price you would pay to rent a pontoon and you don’t have to worry about the driving. Our captains will drive you there, anchor, stay the entire time to assist you and drive you back. The deal gets even sweeter with the option to bring your own cooler of beverages as well as having full access to the boat at Crab Island including restrooms and shade. Dolphins are another unforgettable attraction in Destin and the SunVenture’s Destin Sunset Dolphin Cruises offer an up close and personal encounter with these amazing animals. The SunVenture captains hit the emerald green waters every afternoon for a majestic sunset cruise on a quest to find playful dolphins. The ever-changing sunset is a breathtaking backdrop as you enjoy the open-air deck arrangement giving you a front row seat to the dolphins. Thursdays are special in Destin as the sky illuminates with fireworks near the Harbor. Our Thursday night Sunset, Fireworks, Dolphin and Destin Harbor Cruise is the best of all worlds. Cruising every Thursday at 7:30 pm, the SunVenture captains cruise the waters of the Destin Harbor into a colorful sunset on the quest for dolphins. The evening ends with a bang as the sky above you lights up with fireworks from the harbor. A truly amazing experience. There are so many ways to make unforgettable summer memories on the SunVenture! Which ad’venture’ are you up for? We hope you will join us soon – view our daily Destin cruise schedule and book your ‘venture’ soon!